After my post in may, i purchased my first 3D printer, a prusa Mk3. This was after seeing many electronic “maker” posts and using machines to make models, cases, and prototypes. Of course i wanted to do all of this too. so i jumped head first into it, knowing nothing about the 3D printing. still i was being called a very knowledgeable person in the field only 2 months after getting this printer. see, when i want to learn something, i go all in. i learned how to debug issues in the printer, figure out why a print was not as expected, and about the different materials. 3D modeling was something i said to myself, “eh, im a very good drafter, how hard could it be”, in may ways, i was right. my Drafting knowledge and ability to visualize CAD models helped me. so, i took on several 3D packages. FreeCAD – still in beta, but will do almost everything fusion360 can, its just more clicking and setting values, not much in the way F360 works where there is an arrow you can pull to place/size an object, you have to type in the dimensions and placement. it may be more difficult, but im finding it enjoyable to use. im still learning it how to work with it. Blender – best used for making organic models such as figures and sculpting objects. it seems to focus more on being a 3D animation studio so its not something i will use or explain most of the time. i will be trying several versions of AutoCAD soo, to see how well it works for 3D, i hope it is as easy do use in 3D as it is for me with 2D and ISO modeling. 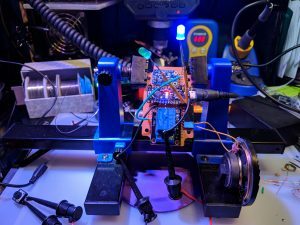 while 3D printing is starting to take off (or i have put myself in that bubble and assume something that’s not accurate), there are many things that stand out about getting the devices to work and output as expected. my Prusa works great, at times it didn’t, something as small as a 2mm grub screw coming loose on a main gear prevented pushing the printing material into the extruder (the part that heats the plastic filament and pushes it out of a nozzle onto the printing surface) and so ….nothing prints. this is not because this is a sub $1000 printer, its because its still new phase of the tech, and many places are working to improve the designs (while other companies just use and rarely innovate/contribute anything or go as far to make an improvement, and lock it up behind a overly broad patent they will licence out for amounts that would break the makers and lerners *breathes*). there is still a ways to go before “every household” will have a 3D printer in the corner of their room to make a replacement gear for their dryer. as it stands, this is still a tinker toy, its for those willing to get their hands dirty with a tool that needs care and attention sometimes. its funny, when i show or say i model things for 3D printing, the first question i get is ” oh, have you printed a gun”, and i have to go explain to them how thats not how or why people do 3D printing. anyway, im going to be doing little tutorials on 3D printing, its good, and bad. problems/solutions. and im about to go into CNC machines too. i have a thingiverse.com account, and it has some of the things i have made, there are several other things im working on that have not been uploaded or are just not done yet, have a poke around. dont worry, soon i will be posting tutorial stuff, playing catch-up right now, giving my opinion and input. will add a few back tutorials on problems i had to fix. im currently going through all my old “fix it one day” stuff and fixing or trashing. if i fix it there may be a tutorial. if i trash it, i may post something about its life.